Controversial Senator Gaston Flosse, the conservative Tahitian politician who has dominated political life in French Polynesia for more than two decades, plans to sue France 3 television over a documentary broadcast last week. The programme, Death in the Tropics, implicated Flosse in claims about the 1997 disappearance of a Tahiti journalist, Jean-Pascal Couraud (pictured), widely believed to have been murdered. The programme, which was broadcast in Tahiti and in France, explored the mystery surrounding the affair which has been at the heart of a stalled judicial investigation. Flosse, president of French Polynesia’s local government when Couraud - known as "JPK" - disappeared, was quoted in Tahitipresse as saying he had been accused of "the most abominable deeds". He plans to file a defamation writ because the TV programme - in the Tempo investigative series - didn't give him any right of reply in the face of the allegations. Flosse claims the programme violated the basic principles of democracy. Cyberspace is running hot over at Google's PIMA.nius group over the future of Pacific Radio Network and its pan-Pacific radio stations, including NiuFM. The network recently announced restructuring and staff were invited to reapply for jobs. Several jobs are on the line. And tomorrow is D-Day for redundancies, according to the coconet wireless. Pacific Islands Media Association (PIMA) this week posted a statement saying that it accepted the need for restructuring and called for patience. But chairman Aaron Taouma says this "process is unfortunate" and his statement shouldn't be interpreted as PIMA backing for the PRN move. "Let's make this a positive new beginning for Pacific media and Pacific radio broadcasting," he says. "Get rid of old shackles and bonds and begin again." PIMA seeks to work in the interests of all Pasifika media people. And it can be tricky balancing interests. Some of the PIMA.nius online posters have been calling for some sort of a public debate. Their argument runs that, as the network is a community broadcaster and receives considerable public funding, it ought to consult more with a broader Pasifika media fraternity, at least. The pro-debate lobby is being led by Will 'Ilolahia and others who have been frustrated at what they think is stonewalling by both PIMA and PRN. So Will has set up his own blog to hear from disgruntled NiuFM fans who want a voice. If you have something to say, then you know where to go. The word seems to be that PIMA is having a rethink and might organise a wider "general media forum". A good idea. Stop Press: Since I posted this item, a nutter has apparently run amok on Will's Pasifika broadcast gripes blog. Somebody closely associated with NiuFM - we all know who she is, of course - "TellTheTruth" can hardly get anywhere near the truth through her fog of personal abuse. If this is the sort of hack on the radio station's payroll, no wonder there are so many problems in Ponsonby. If she thinks she is onto something about my protracted and well-known clashes with PINA (now ancient history), then where has she been over the past 20 years? Check this out for balance for the real story behind her selected letters clogging the PiTV blog. She also might actually do some journo's homework and read my 2004 book Mekim Nius! Jason Brown has also filed a riposte on PiTV. For the record, Cafe Pacific has no particular interest in NiuFM - although we want to see it prosper for the good of the Pasifika community. We raise media issues as needed throughout the region as they arise. Amid the fog of political polarisation and ethnic characterisation in Fiji, it is refreshing to have some intelligent and thoughtful debate examining beyond the "race" perspective on Fiji, so often favoured by journalists. Ethnic and political identities are not identical, as University of the South Pacific's Professor. Despite this, the two have been molded into inseparable components of communal politics, says sociologist Dr Steven Ratuva, of the University of the South Pacific. Speaking at a public forum on identity and belongingness in Fiji, he was reported by the Fiji Times as saying the contest for state power continued to be based on ethnic and political identification and consciousness. The 2000 coup brought to surface a lot of contradictions of communal democracy. “But the State system has not in itself changed despite the change in ideological and professional focus of the military from being an institution of indigenous rights to one which serves national interest." The 2006 coup was an attempt to transform the identity of the state in a fundamental way through institutional reform and a proposed charter, he said. And now the debate is on about the legitimacy of this approach. Ironically, Fiji Human Rights Commission's Ombudsman Shaista Shameem, under attack from various media quarters over her leaked 41-page report upholding the "right" of the Fiji regime to deport foreign newspaper publishers Evan Hannah and Russell Hunter (both Australian), has a chapter in a media book being published in Fiji tomorrow. In this, she isn't very charitable about journalists and objectivity. "Can we, in reality, expect objectivity from journalists? Human beings , by nature, are not objective... Journalists cannot pretend to be objective. ... The role of the journalist is to scrupulously provide all sides of the story allow people to make up their own minds." "There is no such thing as objectivity of perspective; there are only subjectivities, including prejudices, and these must be kept firmly under control to protect journalistic professionalism. "The right to a fair hearing is a requirement in reporting a story..."
In her book, there is far too much "manipulation" by media in the Pacific. But the chapter is generalised with no specific examples of her claims. In her adjudication in the Hunter and Hannah complaint (filed by "Opposition Leader" Mick Beddoes), there is an attack on an alleged "conspiracy" involving the New Zealand government - highlighted today by the Sunday-Star Times. Meanwhile, media freedom in the region continues to deteriorate with Cook Islands News publisher John Woods becoming the latest journo to face the wrath of bureaucratic or judicial vindictiveness. He has been convicted of contempt in the High Court on Rarotonga over the breach of a suppression order related to a Manihiki land controversy. Mike Field and others have also reported on the police raid on Fiji Television to block a Close Up current affairs programme featuring Rajendra Chaudhry that irked the regime. FHRC "Report on investigation into circumstances and facts involving the deportation ... of Hannah and Hunter"
A new book on Pacific media is being launched in Suva, Fiji, on Monday to add to the growing literature on Pacific journalism. With a core of University of the South Pacific contributors and journalists and media analysts around the region, Media and Development will be exploring critical issues facing the Pacific - and what journalists can do about it. No doubt this publication will become a core text at the USP and other journalism schools, at least for postgraduate students. 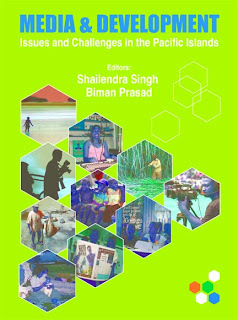 Published by the Fijian Institute of Applied Studies and co-edited by USP journalism head Shailendra Singh and economics professor Biman Prasad, the team of 23 contributors - including me - ought to be congratulated on the effort. After the book launching by Fiji Media Council chairman Daryl Tarte at USP, the co-publisher - Pacific Media Centre - will have another launch in Auckland further down the track. The media has a crucial role to play in facilitating quick and better access to information about issues such as health, education, technology, economy and politics to help to maintain the social and political cohensiveness that is so important for development in small and vulnerable countries. 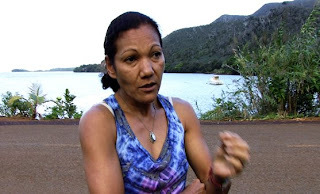 Clashes in New Caledonia persist over nickel mining and coral reefs as indigenous Kanaks campaign for customary authorities to have more say in decision-making over resource development, says an environmental campaigner. Marina Kahlemu, former president and now secretary of the Corail Vivant environmental group, says the struggle to save the reef is critical in the face of major mining projects. She talked about her people's struggle on a visit to the Pacific Media Centre this week with Canterbury University internship student journo Yvonne Sargayoos. Marina is on her way to Quebec where the next stage of the campaign to have New Caledonia's coral reef classified by UNESCO as a world heritage site is set. 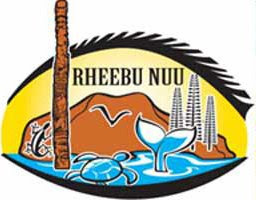 Grou ps like Corail Vivant and the more militant Rheebu Nuu have been at the forefront of the struggle. AUT film maker Jim Marbrook is working on a doco about the dilemmas of nickel mining and economic development and protecting the fragile environment. From what we've seen of the rushes so far, Jim has a compelling and doco in the making - one that indigenous campaigners protecting a way of life will find inspiring. Photo: Marina Kahlemu ... campaigning to save New Caledonia's reefs. Photo: Jim Marbrook. Video: Jeffery Zweig at a meeting earlier this year planning to halt the pipeline work. Just 11 years or so after it was founded, Pacific Media Watch has discovered a new lease of life at its new home at AUT University. Always with an eye to journalist freedom in the region - and sometimes a persistent thorn in the side of self-interested media fat cats - the voluntary media monitoring service has been relaunched as a "future proofed" dynamic digital resource. Launching the database along with the latest edition of the research journal Pacific Journalism Review, Office of Pasifika Advancement director Pauline Winter described the new media resource as invaluable for media and journalism schools. 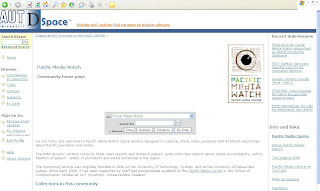 The new Pacific Media Centre took over development of the PMW service last year and has established the database as the first project on DSpace, a digital archive set up by the university's Creative Industries Research Institute (CIRI). The revamped service combines more than 5000 news reports on Pacific media freedom, ethics, education and training issues - updated daily - with a major archive of media research reports and documents, and audio and video clips. But the new database is just at the first stage of its new development. Many new improvements will come in the months ahead. The original PMW news monitoring service was established in 1996 as a journalism partnership between the University of Technology, Sydney, and the University of Papua New Guinea. The University of the South Pacific journalism school has also been a key contributor in recent years. PMW campaigned in support of Tongan publisher Kalafi Moala, fellow journalist Filokalafi 'Akau'ola and pro-democracy MP 'Akilisi Pohiva who were wrongfully jailed that year for contempt of Parliament. At the launch, I paid tribute to the researchers and students involved in the centre. But I would especially like to single out Sydney television journalist Peter Cronau for his sustained work on PMW over many years - including setting up the original PMW website and Kiribati journalist Tabs Korauaba who helped work on developing files for the digital archive last year. Goodbye PNG rainforest - hello ecodisaster! The lush tropical rainforests of Papua New Guinea are not the unspoilt haven that many believed till now. In fact, they are disappearing faster than those in the Amazon. That's the conclusion of a team led by Phil Shearman of the Remote Sensing Centre at UPNG in Port Moresby, who applied pattern recognition software to recent satellite images, and paired the results with map data from the 1970s to reconstruct the rate of forest loss. The team presented its findings ... at a workshop on climate change, forests and carbon trading in Port Moresby. Their study found that in 2002, 1.4 per cent of PNG's forests were cleared or degraded, increasing to 1.7 per cent in 2007. If the trend continues, more than half the forest that existed when PNG became independent from Australia in 1975 will be gone by 2021. The forests of Papua New Guinea are being chopped down so quickly that more than half its trees could be lost by 2021 ... Papua New Guinea has the world's third largest tropical forest, but it was being cleared or degraded at a rate of 362,000 hectares (895,000 acres) a year in 2001, the report said. Phil Shearman, lead author of the study, said: "Forests are being logged repeatedly and wastefully with little regard for the environmental consequences, and with at least the passive complicity of government authorities." The researchers compared satellite images taken over three decades from the early 1970s. In 1972 the country had 38m hectares (94m acres), of rainforest covering 82 percent of the country. About 15 percent of that was cleared by 2002. Shearman said: "For the first time we have evidence of what's happening. The government could make a significant contribution to global efforts to combat climate change, as this nation is particularly susceptible to negative effects due to loss of the forest cover." 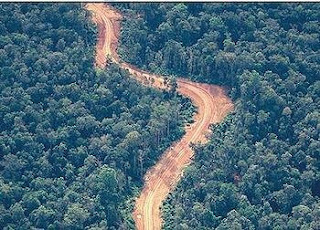 Pictured: Not far behind the PNG rainforest roads, the rapacious loggers. Source: UPNG report.